The Nigerian Army has said it is examining a video being coursed on the social media, which indicates Army personnel attacking a few members of the Indigenous People of Biafra (IPOB). In the three-minute clasp, a flag of Biafra could be seen on the ground before the men who laid face down. They were in the long run whipped and compelled to drink and rest inside dirty water. 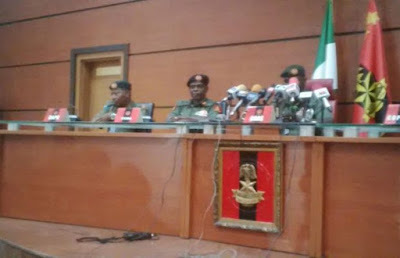 In spite of the fact that, GIFTEDBLOG can't confirm the wellspring of the viral video that surfaced yesterday, the Acting Director of Army Public Relations, Brigadier General Sanni Usman, has said the military pecking order knew about it. He told newsmen Wednesday night: "We know about certain video being coursed. "We have gotten objections of the said video, and have initiated an investigation into the issue and the report would be made public. "The General Officer Commanding 82 Division, Major General Adamu Abubakar, is examining it and whatever it is, we will let the public think about the result," he included.